Popular photo sharing startup Twitpic is shutting down due to a trademark dispute with one of its earliest collaborators, Twitter. Twitpic started its journey in 2008. Twitpic explained that the decision for closing was hard to make. said the social network had demanded it drop an application for a trademark. TwitPic has been one of the most used app that allows users to post pictures to the Twitter microblogging service. Noah Everett, founder of Twitpic, announced in its official blog as "A few weeks ago Twitter contacted our legal demanding that we abandon our trademark application or risk losing access to their API. This came as a shock to us since Twitpic has been around since early 2008, and our trademark application has been in the USPTO since 2009." Twitter reacted on this issues saying that it was sad that the firm is going to shut down, and that Twitpic could have continued to use its name. Twitter said in a statement, "We're sad to see Twitpic is shutting down. We encourage developers to build on top of the Twitter service, as Twitpic has done for years, and we made it clear that they could operate using the Twitpic name. Of course, we also have to protect our brand, and that includes trademarks tied to the brand." 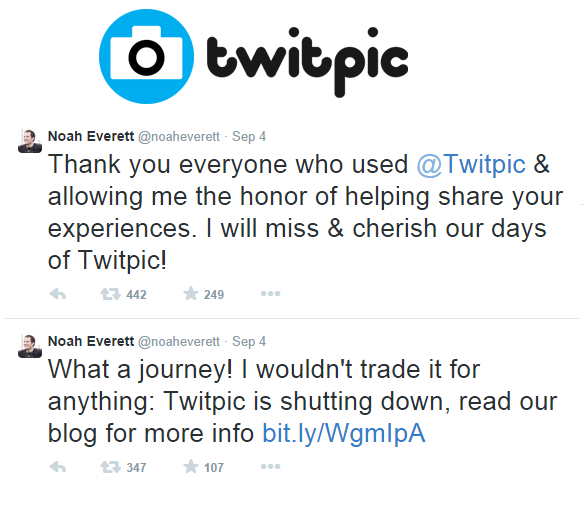 Twitpic will be shutting down on 25th September. In case you have an account and also have data on it then please export all your photos and videos.